Despite their name these beans were introduced to Europe by the Spanish from the Americas! They are started off in the same way, and time, as their climbing cousins. They make a good crop for containers (at least 20cm wide) and they also freeze well. Sow from mid April through to July. A lemony flat podded Romano type flat snap bean. They are considered ripe when they make a crisp “snap” if they are broken in half, and they have a delicious mild flavour and a tender texture. We think they are gourmet quality and we have eaten them just lightly steamed, braised with other veg, stir fried and in casseroles. Plants reach 50cm tall, and they are covered in beans that you can see easily. We were really pleased we tried this variety. The plants are nice and compact with a good crop of crisp pods. These are only 10cm long but this means that a quick top and tail and maybe cut in half is all that is needed prior to popping them in a pot for a delicious meal. Our customers are not so keen on flat podded beans, this is such a pity as Nassau is lovely. They have a well-deserved reputation for flavour and texture. The succulent green pods are about 15cm (6”) long,stringless and are easy to pick from the vigorous knee-high plants (my knee height!). We were impressed with the yield of this lovely dark seeded dwarf variety: it can reach 50-60cm tall. It produces tender, slim pencil pods with top quality taste. You can wait until the pods reach 12-13cm long or simply pick them off once they reach just beyond the width of your palm. 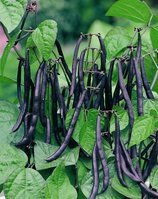 This AGM winner is quick to grow and so you can get some of the earliest beans with this variety and squeeze in a late crop in September/October from a July (August in milder areas) sowing. A reliable and prolific variety with a good flavour. Price for 50 seeds.